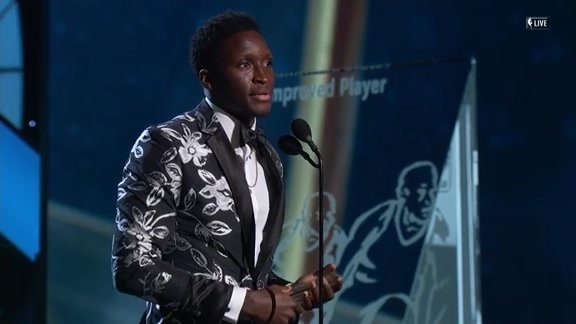 June 25, 2018 - Victor Oladipo was named the NBA's Most Improved Player during the 2018 NBA Awards. 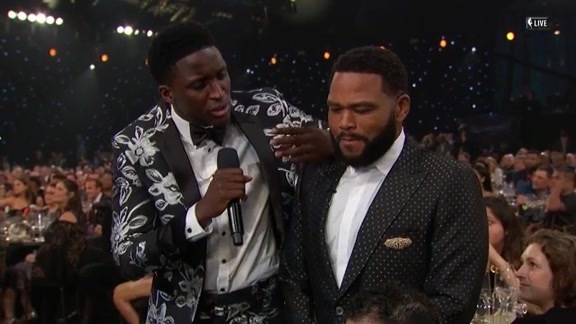 June 25, 2018 - During the 2018 NBA Awards, the league's newest Most Improved Player surprised the crowd with some singing. See why the Pacers' Victor Oladipo won the 2018 Kia Most Improved Player. 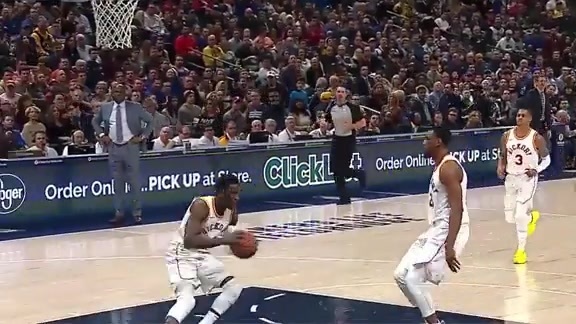 Check out the top plays from All-Star Victor Oladipo's stellar 2017-18 season. 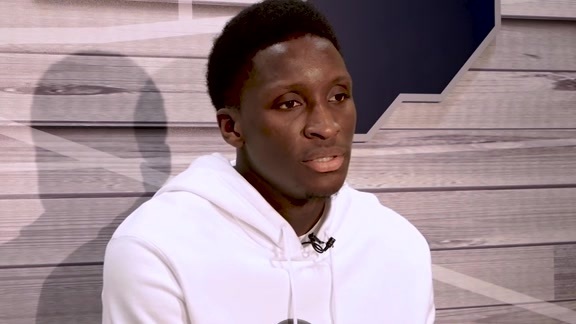 Pacers guard Victor Oladipo reflects on his first All-Star season and discusses his plans for improvement during the offseason. For the Pacers, the best thing about Victor Oladipo winning the NBA's Most Improved Player on Monday is that he'll be the first to admit he's in need of further improvement. Maintaining that approach to a career that received a kick-start last season following a controversial trade with Oklahoma City should be the secret to avoiding the fate that awaited previous award winners. After all, being named the league's Most Improved Player for one season doesn't equate to achieving the most improvement a player can muster. At 26 years old and a veteran of five NBA seasons, Oladipo believes he's still climbing toward the peak of his career. He made that clear after he was selected to his first All-Star team last season and was asked in what areas he can improve. "Oh, man, so many," he said then. "I can always become a better shooter, better decision-maker, better at time and score as far as ending quarters, halves, games. I still have a lot of room to improve in general. I want to dominate night-in and night-out, and I feel like I still have a lot of work to do to get there." 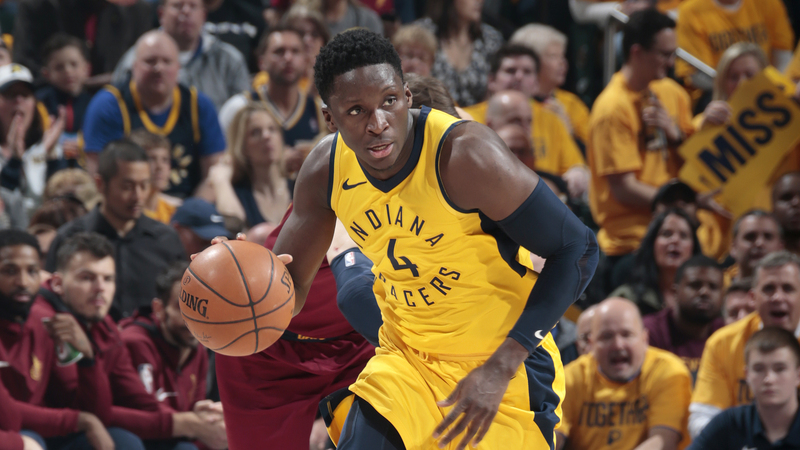 Oladipo becomes the fifth Pacers player to win the Most Improved honor, which was first awarded after the 1985-86 season. He follows Jalen Rose (2000), Jermaine O'Neal (2002), Danny Granger (2009), and Paul George (2013). Orlando is the only other franchise to have as many recipients. Other award winners who also played for the Pacers are Aaron Brooks (Houston, 2010), Monta Ellis (Golden State, 2007), Darrell Armstrong (Orlando, 1999), and Scott Skiles (Orlando, 1991). Former Indiana high school players who have won the award include Skiles, Alan Henderson (1998), and Zach Randolph (2004). Oladipo won without the benefit of a dramatic spike in playing time, as is often the case with honorees. He averaged 33.2 minutes per game in Oklahoma City, and 34 for the Pacers. What changed was his body, which he worked on diligently last summer to become lighter and stronger, and his role. He quoted his usage rate from his season with OKC the first time he met Pacers President of Basketball Operations Kevin Pritchard after the trade, and expressed a desire for it to increase. It did, dramatically. Freed from the shadow of Russel Westbrook, Oladipo's usage rate – which measures a player's involvement in his team's offensive plays – increased from 21.4 percent to 30 percent, by far the most of anyone on the Pacers' roster last season. He not only had the ball more often, though, he also shot more accurately and rebounded better and led the NBA in steals. The most telling stat of his value, however, might be the fact the Pacers lost all seven of the games he missed, and usually by wide margins. Now all Oladipo has to do to satisfy everyone, including himself, is more of what he did last season. That won't be easy, either physically or emotionally. An examination of the winners of the MIP award and what happened in their subsequent seasons is instructive. It clearly does not guarantee future stability or success. Rose, O'Neal, Granger, and George all were traded by the Pacers in later seasons, for example, although for different reasons. Rose no longer fit the team chemistry, O'Neal and Granger were declining physically, and George wanted out. Oladipo, however, appears to have qualities that could keep him in a Pacers uniform for several more seasons, if not for the rest of his career. He's already connected with the fan base like few players in franchise history, not only via his spirited performances but also by repeatedly declaring his love for the state and its basketball tradition – sometimes with words spoken to reporters and sometimes with gestures given to fans after making big shots. One of his primary challenges moving forward will be to keep his ego in check and maintain a strong work ethic, an obstacle some of the previous award winners throughout the league have failed to clear. Although he's openly campaigned to appear in a Disney movie and likely will attract national endorsements and talk show appearances because of his charisma and singing ability, he so far appears to have avoided becoming distracted from the approach that brought him to this honor. "To be a good leader you have to be willing to follow at times," he said after one game this past season. He backed up that philosophy on many occasions. He fit snugly into the Pacers' rarified locker room culture, and in fact was a primary influence on it. He didn't try to command the locker room and didn't place himself above it. He was merely part of it despite quickly distinguishing himself as the team's best player early in the season. Oladipo reached out to teammates after their bad games and constantly passed out credit to them after his better games. He never sought the media spotlight when things were going well, but didn't hide from it when he struggled. He was the guy who sang in the shower after victories, sang in the locker room before practices and occasionally let out a scream for no particular reason other than to inject some life into the room. "One thing about Victor, he remains the same," Darren Collison said. "Whether he's playing well or not, he's the first person to scream in the mornings. You don't like it, but he's himself. He doesn't change his personality because of a bad game." Collison made those comments during the playoff series with Cleveland, when Oladipo slumped offensively. He opened by hitting 20-of-39 field goal attempts over the first two games, followed by hitting just 12-of-50 shots over the next three, then bounced back to hit 21-of-40 in the final two. The Cavs made him the apple of their defensive eye, forcing him to adapt to the kind of double-teaming pressure he'll likely see often throughout the rest of his career. He earned that attention the first two games, struggled with it over the next three, and overcame it in the final two. Equally telling was his reaction to the Pacers' Game 7 loss in Cleveland. According to Pritchard, Oladipo reported to St. Vincent Center at 7:30 the following morning to work out and get up shots. "He walked over to me and said, 'This is just the beginning. I'm going to take my workouts to the next level,'" Pritchard said later. Pritchard and general manager Chad Buchanan challenged him to do so by queueing up the Milli Vanilli song, "Girl You Know It's True" when he walked in the room for his season's exit interview. "That's the biggest one-hit wonder that's ever happened," Pritchard told him. "Are you a one-hit wonder? Was this a one-year deal?" Oladipo responded by saying he's more of a Michael Jackson fan, then made clear his intention to have a lasting career. He had done the same while talking with reporters earlier in the season. "I put in the work," he said. "I work every day. I have no limit to how hard I work. I'm trying to be great. There's no in-between and I can't settle for anything less." Donnie Walsh, the former team president who now works as a consultant, sees the same work ethic in Oladipo that he witnessed in Reggie Miller, who was the runner-up to Rony Seikaly for the MIP award in 1990. "He comes in the morning to shoot on the day of games," Walsh said of Oladipo. "He's doing it the right way, I'm telling you. That's what I remember with Reggie. Reggie did the same kind of thing, but did it more to himself. He'd go in the practice gym to shoot when nobody else was in there." Because that's where improvement is found. A look at Victor Oladipo's improvement from his previous season to his first season with the Pacers.